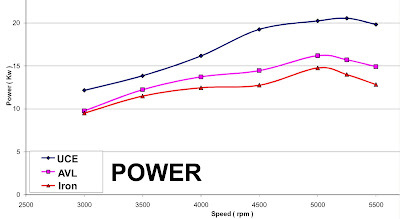 2009 Royal Enfield Bullet G5 is faster. 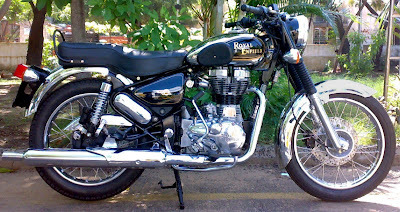 The big news for Royal Enfield motorcycles in 2009 is added performance. The new unit construction engine (UCE) looks great, saves gas and stands to be far more reliable and need less maintenance than any previous Royal Enfield motor. But who cares? What we want to know is: how fast it will go! Sure seems like an odd question, considering that for 50 years Royal Enfield has been selling tradition and, in effect, encouraging riders to slow down and enjoy the ride. Actually, there was no need to slow down. The rider of a Royal Enfield Bullet would have to look hard in the United States to find a speed limit he could exceed for any length of time. Royal Enfield dealers from around the Midwest gathered Feb. 12 and 13 in frigid Faribault, Minn. to see and sample the new Royal Enfield Bullet G5 with the UCE engine. They actually rode it, in 20-degree weather, and found it definitely stronger than Bullets that have come before. You could really feel it," one said. And it wasn't just the wind-chill factor. Engineers on hand from the factory in India distributed materials that promised a top speed of 82 mph and acceleration of 0-60 in 3.9 seconds! OK, that's 0-60 kilometers per hour; roughly 0-40 mph in 4 seconds. Enough to keep up with the minivans in city traffic. How much of an improvement is that? The charts tell the story best. 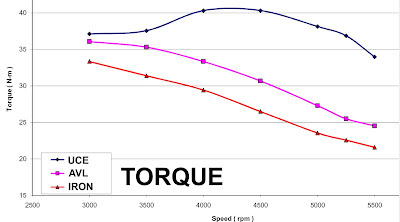 Here are graphs comparing the new engine to Royal Enfield's AVL (all alloy) motor now in showrooms and to the classic iron-barrel engine whose design dates back to the 1940s. When it comes to speed, the Royal Enfield Bullet is really only in a race with itself. You do not buy an Enfield to go fast. In fact, you might say that you would buy a Royal Enfield to travel back in time, not forward. Soon, however, you will be able to buy one of these time machines that will keep up with traffic. The 2009 models are arriving in the United States now, according to Classic Motorworks, the U.S. importer. They will be at your local dealer soon. Last we heard, Manufacturer's Suggested Retail Price for a 2009 G5 Bullet was $5,995.